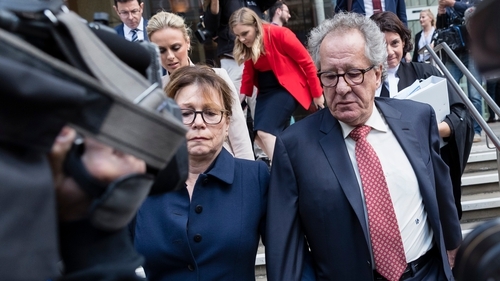 Academy Award winning actor Geoffrey Rush has won a defamation case against an Australian newspaper over reports that he behaved in an inappropriate sexual way to an actress. A front-page story in 2017 claimed that the Sydney Theatre Company received a complaint that Rush had inappropriately touched a female co-star during a staging of King Lear. A judge in Sydney ruled that the Daily Telegraph had produced a "recklessly irresponsible piece of sensationalist journalism" and awarded Rush Aus$850,000 (€540,000) in damages. "There are no winners in this case, it has been extremely distressing for anyone involved," Rush said in brief remarks outside the court, calling the months-long legal case a "harrowing time". The judge said that actress Eryn Jean Norvill's evidence was inconsistent and that she "was at times prone to exaggeration and embellishment". Judge Wigney said he would assess further damages for lost earnings at a later date. Rush won the Oscar for Best Actor in 1997 for his role in "Shine" and is one of the few stars to have also won a Golden Globe, an Emmy and a Tony Award. The Daily Telegraph is owned by Rupert Murdoch's News Corp.